the clouds "BPOS" And thus the reason we are messaging accordingly. Registered Microsoft Partner We specialize in Microsoft Hosted Online Service sales. Are you a partner or a customer of Microsoft ? Are you currently using BPOS? How big is your org ? What would you like to discuss at the Meetup? You must be signed in to post a Greeting. "Great having you here Scott- Hopefully you can join us on mar 16th. We will be having the GM of the engineering team who would love to hear about your experience so far." 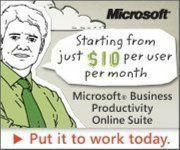 "Registered Microsoft Partner We specialize in Microsoft Hosted Online Service sales."